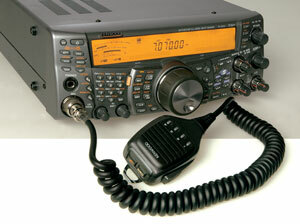 The hobby of Amateur Radio has a long and proud tradition that is worth knowing. 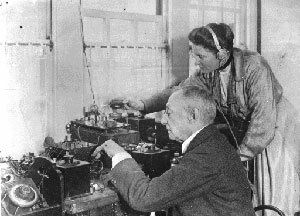 It began with experimenters dabbling in the then scientific oddity of wireless, went through the broadcasting era of the 1920s, and grew strongly after WWII. The people involved in it became the mainstay of technical professions and developed much of the technology we use today. A lot has changed in Amateur Radio, but it is even more relevant and accessible than ever before. The emphasis is now on those wanting to enjoy Amateur Radio, to have the knowledge and skills to demonstrate a practical ability to put together a station from commercial equipment, and operate it safely, competently and without causing interference to other users of the radio spectrum. The aim of the Foundation Licence is to be a stepping stone or entry point, giving you a real taste of Amateur Radio and the fun it provides. The Foundation Licence can operate in the bands listed below using the modes listed in the right hand column. Use of commercially manufactured transmitting equipment only is allowed. 3.5MHz (80 metres) Typically up to 150KM during the day and up to 3000KM at night. 7MHz (40 metres) Typically up to 1000KM during the day and during good conditions world wide at night. 21 MHz (15 metres) World wide mostly during the day. 28 MHz (10 metres) World wide during periods of high sunspot activity and up to 3000km in summer. 144MHz (2 metres) Local coverage and world wide via "IRLP" and EchoLink. 432MHz (70cm) Local coverage, over 2000 km using something known as tropospheric ducting and world wide via "IRLP" and EchoLink. The WIA Foundation Licence Manual is a book containing relevant information for those studying for a licence. Because it is so easy to read and understand, has also become a reference book on lots of common topics. The manual has all the relevant information you will need to successfully complete a training course to obtain a Foundation Licence. It also contains a wealth of information all radio amateurs need, like understanding Band Plans, electrical safety, operating procedures, how to contact a local radio club, the WIA and much more. 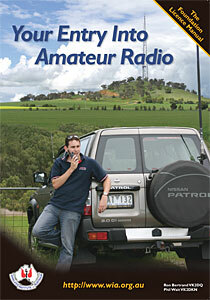 The Foundation Licence Manual - Your Entry Into Amateur Radio – is available from several sources. It can be purchased by clicking Foundation Manual on the left hand menu bar of this webpage, from the WIA office in Melbourne, via many radio clubs, and many equipment suppliers. The price is $34.50 plus postage, WIA members can purchase the Foundation Manual at the special members price of $24.50 plus postage. A popular way to learn more about Amateur Radio is to attend interesting lectures often held by knowledgeable radio amateurs. There are over 70 radio clubs with training courses for the Foundation Licence. 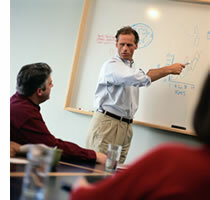 Some training courses are held over several weeknights, while most are on a weekend. Contact details for radio clubs offering training and assessments can be found under Radio Clubs on this website. The examination and callsign recommendation services previously provided by the WIA ceased on 1-Feb-2019. In future these services will be provided by the Australian Maritime College (AMC). More details will be provided as they come to hand. Most questions about how to join Amateur Radio may be answered by the WIA or through this website. The WIA does not have the resources to answer a large number of telephone inquiries. If you need to contact it with a question not answered by the website material, click on the ‘Send Me More Info’ menu item on the left and completing the online form.